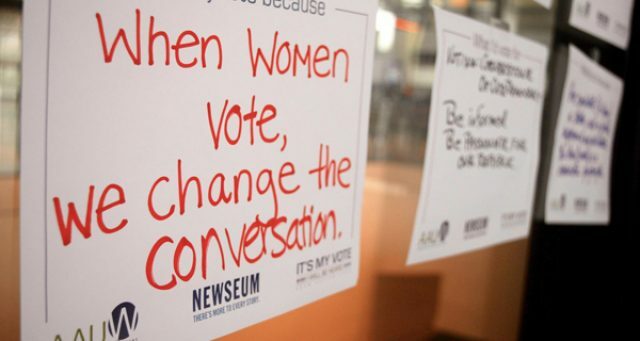 With the national political climate as tense as it is, the Goshen College chapter of the American Association of University Women (AAUW) chose to jumpstart their campus presence this year with an all-campus voter registration drive. The registration, organized by AAUW leaders Marris Opsahl, Nasim Rasoulipour, Lexus Garces and Gi Salas, took place in stations across campus on Oct. 1 to encourage students to be “politically engaged” and vote in the upcoming midterm election. In total, the Goshen College’s AAUW voter registration helped 16 students register to vote for the first time, in addition to 11 who filled out the available absentee ballots. In an effort to reach as many people as possible, the AAUW leaders spread out across campus, seated behind folding table stations covered in papers and pens to encourage passersby to pause and register to vote. Each station included forms for new voter registration, as well as neatly stacked piles of information sheets and absentee ballots from neighboring states like Ohio, Michigan and Pennsylvania. Opsahl, a junior social work student and president of GC’s chapter of AAUW, said that although the club is similar to the Goshen Student Women’s Association (GSWA) in terms of issue awareness, the two clubs differ in purpose. Goshen College’s chapter also makes it a priority to promote intersectionality, especially within the club. “AAUW is sometimes seen as pretty white, a product of second and third wave feminism (that) only promote issues of white feminism,” Opsahl said. The goal is to reach all women of any background, she said. Opsahl, along with faculty advisers Beth Martin Birky, special assistant to the provost for Title IX, and Kathy Reimer, professor of education, spearheaded the voter registration initiative because she believes that people can “impact the most change” by engaging with their local government. “Even if you’re not super participatory in … state issues or national issues, you can really be involved in your own community and affect change that way,” Opsahl said. Knowing who is on the local city council or school board is a good first step toward political involvement, she said, especially if combined with attending meetings and voicing concerns. In Opsahl’s opinion, the government is like “a pyramid,” with local government forming the base of district, state and national political positions, with values “permeating the layers” up to a legislative level. This millennial generation is more “open to collaboration,” which should be reflected in the leadership that governs it, she said. This is just one of the reasons why Opsahl, along with others, felt that having a chapter of the AAUW on campus is important. Some of the AAUW’s advocacy efforts include inviting speakers to give talks about women’s rights in terms of workplace equality, voting, and legal treatment and other topics that concern how women are treated and viewed in society. According to the Goshen College Student Financial Aid Office, certain chapters of the AAUW, like the South Bend Chapter, also award annual $1,000 scholarships to two women over the age of 25 who are enrolled in an institute of higher education like Goshen College. The Goshen City chapter of AAUW continued these efforts at Los Primos Mexican Grill on West Jefferson Street during First Friday in October in hopes of encouraging the city’s residents to become more politically vocal. The last day to register to vote in the Indiana midterm election was Oct. 9.